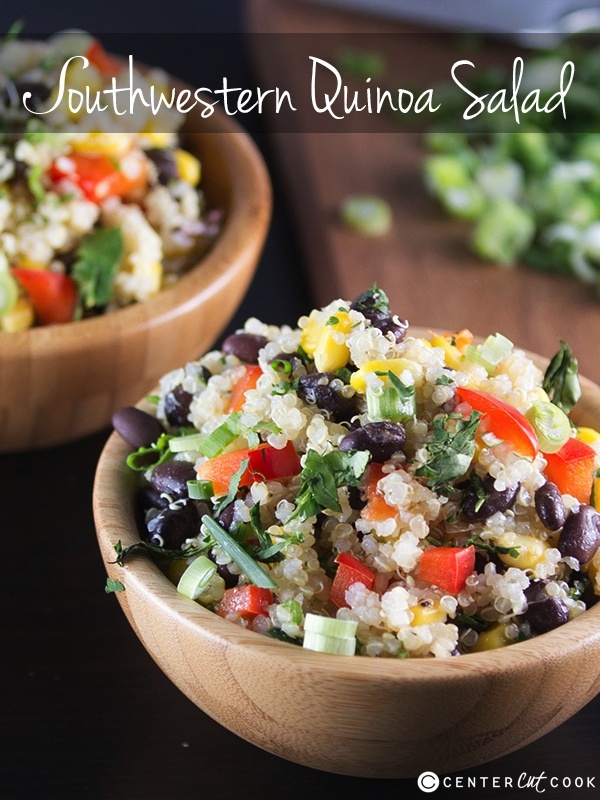 Southwest Quinoa Salad similar to the Whole Foods version with a lime dressing! Clean eating never tasted so good! Last month when I was at Inspire Retreat in Utah (you can read about it here), Whole Foods dropped by with lunch on our very last day and one of the things they brought for us was a Southwest Quinoa Salad. After one bite, I was in love and knew I needed to come home and either make myself a big heaping bowl of the stuff, or go to Whole Foods to buy some. The recipe was just that awesome. When I got home and made a trip to Whole Foods, I was so bummed to discover that they didn’t have it which is when I knew it was up to me to make this Southwest Quinoa Salad happen! You guys, it’s amazing! Clean eating never tasted so good. 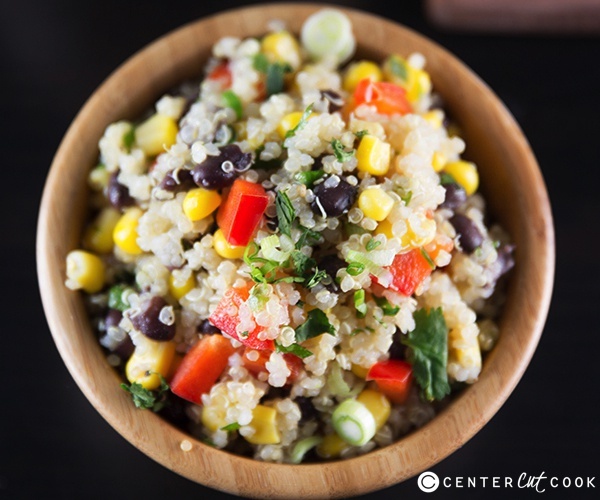 It’s loaded with foods that pack a nutritional punch – quinoa, corn, black beans, red pepper, green onion, and cilantro. The dressing is super simple yet so flavorful too – olive oil, lime juice, a little cumin, salt and black pepper. That’s it. And it’s delicious! It’s also vegan, for any of you vegans out there. I’m not quite sure how close this comes to the Whole Foods recipe on paper, but taste-wise, it’s pretty darn close! This is a recipe you will come back to over and over again. I ate this Southwest Quinoa Salad for lunch for days, and as a side dish for these Baked Chicken Flautas! It works perfectly as a light lunch or a side dish and it’s healthy! Notes: If you have never bought quinoa before, you can usually find it in the same aisle as the rice and lentils at the grocery store. Alternatively, some grocery stores keep it in their health food section. My favorite place to buy it is at Costco, simply because the price cannot be beat! Cook 1 cup quinoa according to package directions. I like to cook my quinoa in either vegetable stock or chicken stock to add a little flavor. I also like to rinse it before I cook it. To do this, just place the quinoa in a fine mesh strainer and rinse it under water for a few minutes. When the quinoa is done cooking, fluff it with a fork, transfer it to a large bowl, and allow it to cool completely (about 15 minutes). In a small bowl whisk together lime juice, olive oil, ground cumin, black pepper and salt. 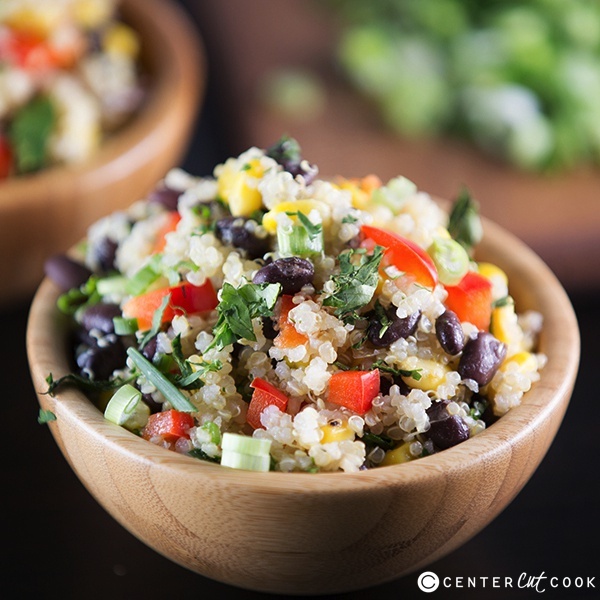 When the quinoa has cooled, add in black beans, corn, red bell pepper, chopped green onions, and cilantro. Stir in dressing and toss to coat. Cover and refrigerate for at least an hour before serving. Leftovers the next day are even better!